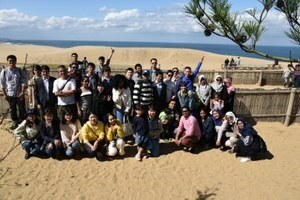 Approximately 40 international students including 11 from Osaka Prefecture University in addition to the ones from Osaka City University participated in the annual one day excursion on Saturday 13 October 2018. 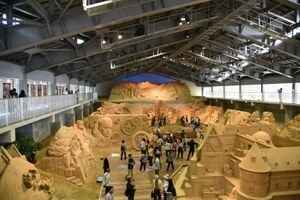 The purpose of the excursion was to visit the Tottori Sand Dunes and the Sand Museum and the international students appreciated the biggest sand dunes in Japan, the Sea of Japan and sand art. On the way they listened a tale of a Japanese myth “A White Rabbit of Inaba” both in Japanese and English and learned the derivation of the Hakuto Coast near the Tottori Sand Dunes as well as the Hakuto Shrine.